Small but productive Nut Roller that takes the back-breaking frustration out of gathering your nuts! Just released! Bag-A-Nut's handheld Nut Picker Upper! Stab it! Capture it! Release it! Effective and fun! 12" Nut Roller-- fast, fun and effective means of gathering your nuts! 18" Extra Capacity Nut Roller! 50% more than our standard model to collect more nuts quicker! 36" Push Nut Roller with Double Baskets! Double collection space=double nut harvest! Double the fun! 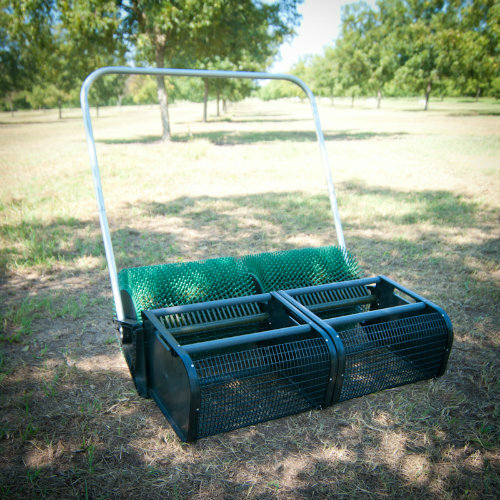 36" Pull Behind Nut Picker Upper by Bag-A-Nut-- attaches to your riding lawn mower, golf cart or ATV!